Timberland Partners is among the new developers, adding 599 housing units immediately adjacent to light rail in a trio of projects at both ends and in the middle of the Green Line/Green Line Extension. And you can be sure the company will tout proximity to light rail in its marketing materials, said Ryan Sailer, Timberland Partners vice president of development, who disputes skepticism of the LRT effect on development. “While you may not be able to attribute all development along the LRT to the LRT itself, the LRT has been a key driver in how cities look at redevelopment in terms of density, efficiency, housing affordability and creating cohesive development. Without the LRT, I don’t believe we would be seeing the activity, scale or diversity in projects we are currently seeing proposed and built by developers,” Sailer said. Timberland Partners’ Green Line projects are its $61 million Elevate apartment/retail mixed-income project at SouthWest Station in Eden Prairie, its $40 million 333 on the Park luxury rental development in Lowertown St. Paul and its $56 million Green on Fourth mixed-income development adjacent to Prospect Park Station in Minneapolis. Light rail has an undeniable economic impact, agreed David Wellington, director of acquisitions and development for Wellington Management, which has projects along the Green and Blue lines. “There is clear and irrefutable evidence of this. We developed mixed-use properties along these lines, and it has turned into a place where people can live and have access to employment. I can say we would not have built our Lake Street Station building if the light rail line was not there,” Wellington said. The planned Southwest line has drawn attention to areas ripe for redevelopment, said Julie Wischnack, the city of Minnetonka’s planning director. Experienced developers who have developed projects close to existing LRT lines have already been inquiring about sites along the proposed Blue Line Extension in Brooklyn Park, said Kim Berggren, Brooklyn Park’s community development director. “Our businesses and educational institutions, including North Hennepin Community College, recognize the importance that the next generation of workers places on access to frequent transit service. The Blue Line Extension will give Brooklyn Park a competitive advantage in attracting young talent. Design Ready Controls and Takeda Pharmaceuticals are two of our businesses who cite the Blue Line Extension as a reason for locating in Brooklyn Park,” Berggren said. Eden Prairie Center shopping mall. Another six Fortune 500 companies are on the existing LRT lines in downtown Minneapolis. The Blue Line Extension has 16,200 jobs within one-half mile of its 11 planned new stations and is expected to grow to 20,800 jobs along the route. Target, another Fortune 500 company, has its Northern Campus in Brooklyn Park as a major job center on the line. The Met Council has tallied $5.8 billion in development announced, under construction or already built along the Green Line, up from the previously reported $5.1 billion in January 2017. More than half of that growth ($2.908 billion) has occurred outside downtown Minneapolis. The other half ($2.871 billion) has occurred along the mile of track with five stations shared by the Blue Line in downtown Minneapolis. Development highlights include mixed-income housing around the Minneapolis-St. Paul border between the Prospect Park and Raymond Avenue stations and general economic revitalization along the eastern end of University Avenue. The Southwest LRT Project, which will begin construction in 2018 and open in 2023, has experienced more than $1 billion in development announced, under construction or built, up from $515 million reported in January 2017. Highlights include a mix of projects around the planned West Lake Street Station in Minneapolis, the recently opened Moline apartments adjacent to the Downtown Hopkins Station, the $60 million Mariner apartment project planned near Opus Station in Minnetonka and the $61 million apartment/retail mixed income Elevate project at SouthWest Station in Eden Prairie. 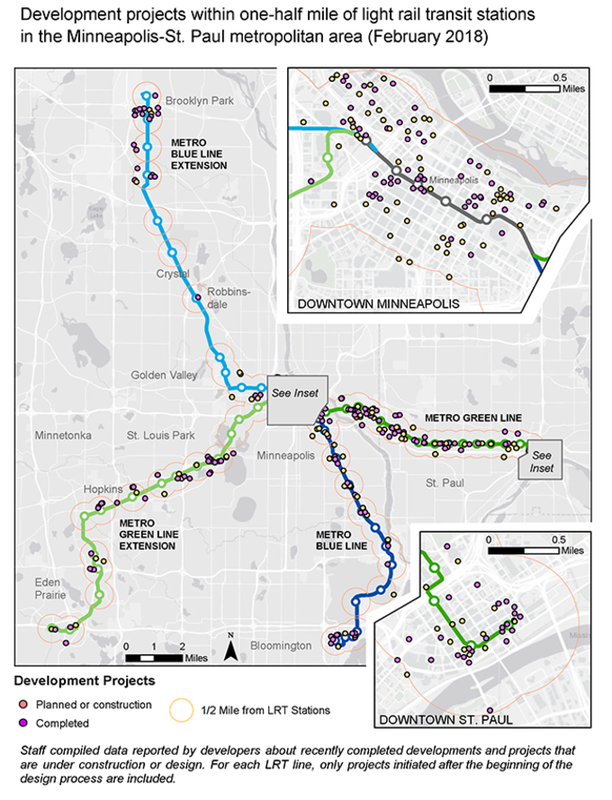 Development along the region’s first line, the METRO Blue Line, is valued at a little more than $1 billion as compiled for only 24 of the 41 projects tracked on the non-shared portion of that corridor in south Minneapolis and Bloomington. The actual value of development along this line is higher because the Met Council began tracking investments only in the last year and what information was originally reported is outdated or incomplete. Projects completed along this line in 2017 include the Richard A. Brustad Homes at the VA Medical Center Station in Minneapolis and Millworks Lofts at 38th Street Station in Minneapolis. Planned and recent development along the Blue Line Extension tallies up to $522 million in investment, up from $489 million reported in January 2017. Commercial, industrial and hotel development is occurring north of Interstates 94/694 to Highway 610 at the line’s northernmost point. Projects under construction on the Blue Line Extension include the approximately $16 million 610 Commerce Center phase 2 and the $16 million Capstone II office/industrial buildings, both near the 93rd Avenue Station in Brooklyn Park, and the $8 million Brooklyn Boulevard Industrial Center near Brooklyn Boulevard Station. The Blue Line Extension Project will connect downtown Minneapolis to the northwest suburbs. *Staff compiled data reported by developers about recently completed developments and projects that are under construction or design. Data also includes higher figures for previously reported projects whose development costs increased as projects advanced. The $8.4 billion figure represents only projects whose value is known. For example, the value has been publicly reported for only 24 of the 41 projects tracked on the Blue Line, which opened in 2004, so the actual figure would be higher than $8.4 billion. Staff did not include figures for TCF Bank Stadium, Target Field, U.S. Bank Stadium, CHS Field or Allianz Field.